LightCorp, the leader in intelligent lighting energy management systems for the high bay space, today introduced a new line of ultra-intelligent LED high bay lighting systems called DayStar. The product is designed, manufactured and assembled completely from LightCorp operations facility in Grand Haven, Michigan, USA. Based on lighting industry expert calculations, theDayStar Intelligent LED high bay is able to reduce an entire facility’s lighting energy usage by up to 95%. 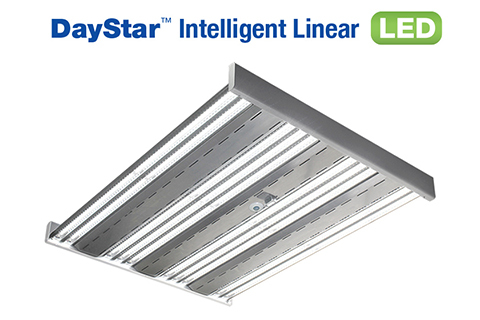 The new line of DayStar, ultra-smart linear LED high bay fixtures are to be offered in 9 different packages in 22” or 44” lengths, with light output performance from 6,000 to 60,000 lumens, and efficacy performance of over 110 lumens per watt. This product will serve a range of applications from warehouses, exhibition halls, manufacturing plants, distribution centers gymnasiums, retail stores, and more. Additional features include, modular LED light bars with adjustable distribution capabilities, hinged, tool-less channel covers for easy component serviceability, an L70 rated lifetime of greater than 100,000 hours, DLC, ETL, Lighting Facts, NOM, RCM, TAA & BAA certifications, and a 10 year fixture warranty backed by LightCorp. The DayStar is the first LED high bay fixture of its kind to offer fully built-in integration of Kanepi Wireless Controls. This allows a facility to use energy only when, where, and to what extent is needed, automatically through 0-100% digital dimming, with pre-programmed and reactive energy optimization strategies. LightCorp is a leading lighting designer and manufacturer striving for customer astonishment with friendly customer service, short lead times and innovative, high quality, American-made products ranging from commercial office and industrial LED and fluorescent lighting, to our patented Kanepi Wireless Controls. Our products are designed to provide energy-efficiency and overall user well-being, creating healthier and more energy conscious modern day workspaces.